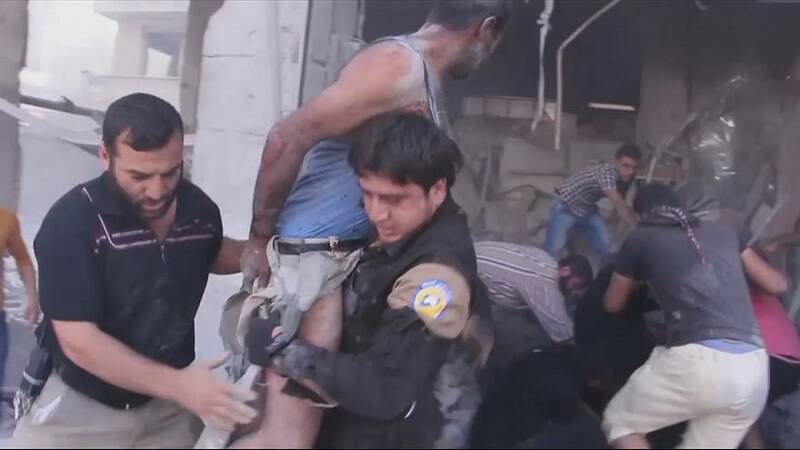 A man and boy were pulled from the rubble of a building after an airstrike at the market in Maaret al-Numan in southern Idlib killed at least eight people on Sunday. Maaret al-Numan lies halfway along the road between Aleppo and Homs, in Idlib province. Abdul-Rahim Almumar, a town resident, said the airstrike struck at a busy car park near a market, causing major destruction and a high death toll. The strike also caused a fire in a store. Almumar said at least 10 were killed, including at least two children. The Syrian Observatory for Human Rights put the death toll at 11 saying it was likely to climb as search and rescue operations continued.